Writing about scary thoughts and feelings has several great benefits for a mother struggling from a perinatal mood and anxiety disorder. And what better outlet than to start blogging about postpartum depression? Thanks to modern technology it is easier to start a blog now, than ever before. And with all the choices available, you can choose whether you’d like to remain private or whether you’d like your voice to be heard around the world. Blogging about postpartum depression not only has benefits for a suffering mother. It’s also an excellent way to help raise awareness about maternal mental health and break down the stigma that exists around it. The more women who are speaking up about postpartum depression and other mood disorders following childbirth, the better. If you’re interested in learning how to start your own mental health blog and speak your truth, here is a quick tutorial on how to start blogging about postpartum depression. Shortly after I was officially diagnosed with postpartum depression, my husband, toddler, infant and I packed up all our belongings and moved 900 kms away from our hometown. We left behind all our friends and family and had no idea how difficult our lives would be over the next few years. If there is one thing that a woman with postpartum depression desperately needs, it’s a good support system… and I just didn’t have one. I moved to a small town where I knew no one, had no job or prospect of one, had no babysitters or daycare arrangements and was a good three hour drive from a major city. Isolated and alone, my postpartum depression grew worse with each passing day. But there was one thing I knew that I could do, even if I had no one to talk to. I could write about it. That’s how I started blogging about postpartum depression. I started my first blog using a free Blogger account because I had no idea what I was doing. I wasn’t thinking about making money or getting followers – I just wanted to write about what I was feeling and share my story. At first, I didn’t write about postpartum depression. I needed a way to work up to that. I wrote about other random things that my kids did or things I learned along my parenting journey. Eventually, I got a new job and made some new friends and I started to feel more confident. So one day, I sat down at my computer and I poured out my story. 100 edits later, I published it to my blogger account and shared it on Facebook for all to see. I was overwhelmed by the response. I started to get messages, both from close friends offering words of encouragement and support, and from contacts whom I barely knew, confiding in me about their own struggle with postpartum depression. One of my new friends in my new town saw me the next day and told me that she cried reading my story and felt so much closer to me, knowing that we shared a similar experience. That feeling of empowerment has stuck with me for years. After that blog post, I didn’t feel the need to write anymore. Once I said my piece and shared what was bottled up inside of me, I felt better. Over the next few years, I focused on my new career, moved a couple more times, and had another baby. I remembered to take care of myself and kept busy and distracted. All the while, the postpartum depression started to become a bad memory. A couple years ago, I began to suffer badly from a condition called endometriosis. I wrote more about my battle with it here. The chronic pain caused a major relapse of my postpartum depression symptoms and I needed anti-depressants just to function. It was at this point that I realized – postpartum depression never really goes away. While researching information about endometriosis, I came across a lot of information about maternal mental health. In all the years since I first suffered from postpartum depression, there didn’t seem to be any forward progress on the way women were treated or how it was talked about. There was still so much stigma and too many women dying or hiding their feelings. I just knew that I had to do something about that. And so I began Running in Triangles. 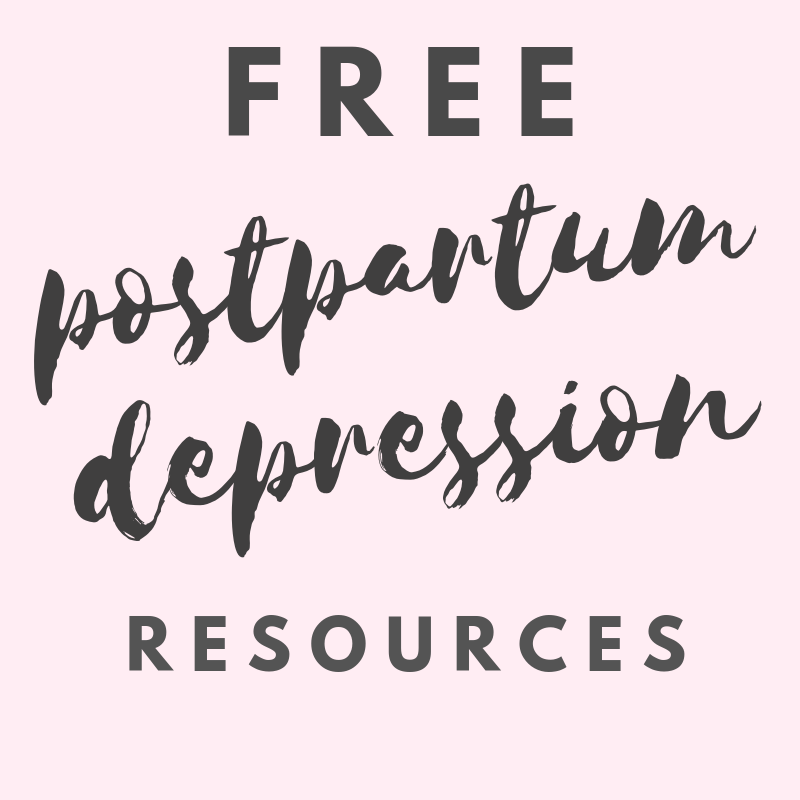 I knew that I wanted to start blogging about postpartum depression again but I put some more effort and forethought into what kind of site I wanted. This time, it wasn’t just about needing an outlet for my own feelings – it was about getting information and resources to the women who needed it the most. Yes, that’s right, start writing your blog posts before you even purchase your domain name. Having a few blog posts ready to publish as soon as your blog is active means a little less pressure on yourself to come up with new content regularly. It will also give your readers a few posts to read right away. Write them out using Microsoft Word or Google Docs so that you can easily cut and paste them once you’ve launched your blog. Start by writing some sort of introduction about yourself. Tell your story – whether in depth or just a brief summary for now. But don’t be afraid to make it known that you are writing about your experience with postpartum depression, anxiety, OCD, psychosis and/or whatever else ails you. Think of your blog as a safe space. Share as many or as few details about yourself as you like. You can write under a “pen name” instead of using your own, or simply use your first name only. Blogging about postpartum depression can make a person feel vulnerable and requires a certain level of openness. Writing out what you want to say BEFORE launching a blog can help you to get comfortable with that. A web hosting service is like your blog’s engine and it keeps everything running smoothly. Running in Triangles is hosted by Siteground, and I would definitely recommend it! The odd time I needed technical support, they were so helpful and quick to respond. Through your web host, you will also be able to choose your own domain (your website’s name), get your own e-mail address (such as yourname@yourblog.com) and install WordPress (Siteground now makes it easier than ever to install WordPress). WordPress.org is a self-hosted blogging platform. It’s the exterior of your blog and the place where you publish content and make it look pretty. If you’re computer illiterate and would prefer something all-in-one that’s already set up for you, and requires very little maintenance, then a basic platform like WordPress.com* or Blogger will work. You don’t need to purchase additional web hosting, but you will also be very limited in what you can do with it. Unless you go self-hosted, you won’t be able to monetize your site or add extra plug-ins to make it unique. *Wordpress.com is different from WordPress.org, so don’t get the two confused. Check out this info-graphic that explains some of the major differences. WordPress.org is actually very user friendly but it can feel intimidating at first. The first thing you will want to do is choose your theme. Your theme sets the tone for the way your site looks. WordPress.org offers a variety of free themes, but you can also purchase a custom made one on Etsy. Thankfully, WordPress.org offers a lot of support for beginners. If you’re ever unsure of how to do something, check out their Getting Started Menu to find tutorials and answers to frequently asked questions. Another design element that you will need for your blog is photos. Photos are a great way to get your message across and help break up long paragraphs of words. If you’re not much of a photographer, or would prefer to keep personal photos off the internet, then consider using free stock photo sites such as Unsplash, Splitshire, Pixabay or KaboomPics. To edit your photos and create graphics for use on your website, use free image editing sites such as Canva or PicMonkey. The community of mental health bloggers is one of the most supportive ones you can find. You can expect to connect with others who have been through similar experiences, and they are generally pretty supportive no matter what your story is. Mental health bloggers don’t look at each other as competition and are always looking to share posts that speak the truth about mental health disorders. Whether you are blogging about postpartum depression, anxiety or another mood disorder – connect with the mental health community to help your voice be heard! Make yourself known on social media by using hashtags so that other mental health bloggers can find you. If you plan to use social media for your blog, make sure to start new “business” accounts and use your blog name (or a shortened version of it) as your username whenever possible. If you plan to recommend products and services that have helped you along your journey, then consider joining some affiliate programs. Check out Shareasale, CJ affiliates or Awin. If you’re serious about affiliate marketing and want to use it to monetize your blog, then I recommend taking the Making Sense of Affiliate Marketing course. It contains everything you could possibly want to know about how to make affiliate marketing work for you. Join the mental health blogging community! There are Facebook groups, group boards on Pinterest and Tailwind Tribes you can join. Twitter and Instagram are also great places to connect with other mental health bloggers, simply by searching for them or clicking on #mentalhealthbloggers. Once you’ve started blogging about postpartum depression – come find me! I would be more than happy to share some of your links, add you to groups, and help you get in contact with mental health bloggers and networks. You don’t need to be alone in this and if you truly feel a desire to start speaking up about postpartum depression, I am here to help! Leave a comment below with your blog URL and I’ll make sure to check it out!